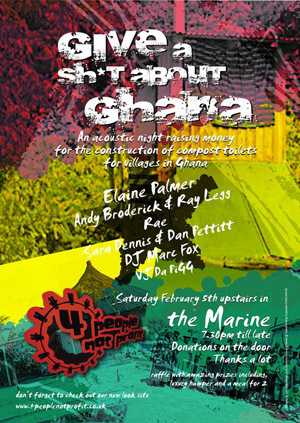 Massive thanks to everyone who contributed to the 4 people not profit gig to raise money for compost toilets in the villages, some also went to a local school to buy essential resouces they needed. it was much appreciated by the organizers of the project and will really make a difference to the villagers lives there, See my page for photo’s from the trip showing a toilet being built and one they had already completed. Also some pics of us teaching in the school. So big thanks again to everyone who made the gig so special before we went, from everyone who played and helped make it happen to all you lovely people who came down and contributed so generously. 4 PEOPLE NOT PROFIT LOVES YOU ALL!!!! !